If you see such warning messages in the ‘vCenter Service Status’, it means the Performance Statistics rollup maintenance jobs are not running properly on the SQL server. 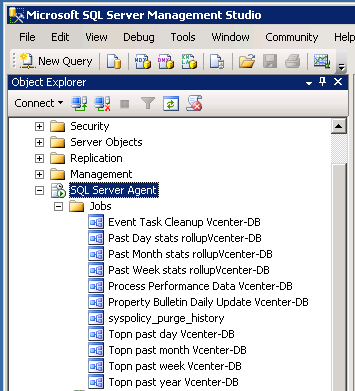 To fix it, login into the SQL server and check the ‘SQL Server Agent’ service is started, and manually run those jobs to see if they can run without problems. You need to re-create those maintenance jobs if they are corrupted (see KB 1004382). I’ve Done that, all jobs run correctly but still get the same warning. Any ideas? Worked for me, good stuff ! Works, thanks, it needs all the jobs to be created and be sure that they are working correctly wait for few hours. The warnings went away after a restart, and when there was data to purge. Nice article, but will this message appear if you are running Oracle as your vCenter database? Never tried it on Oracle. I think it has the possibility as well.